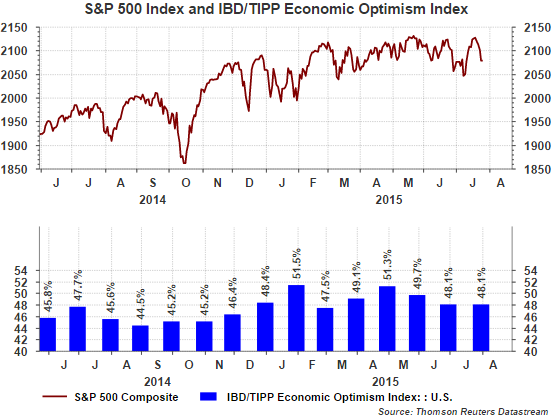 The IBD/TIPP Economic Optimism Index reported this month continues to indicate weak individual optimism. For July the IBD/TIPP Economic Optimism Index was below the neutral 50% level for the third consecutive month. In addition to weakness seen in the TIPP Index, IBD notes, "the Six-Month Outlook Index fell for a third straight month, sinking 0.8 point to 44.5. That's the lowest since last September." In July, Confidence in Federal Economic Policies did increase three points to 44.2, but remains below the neutral 50% level. The TIPP Index is comprised of three components. 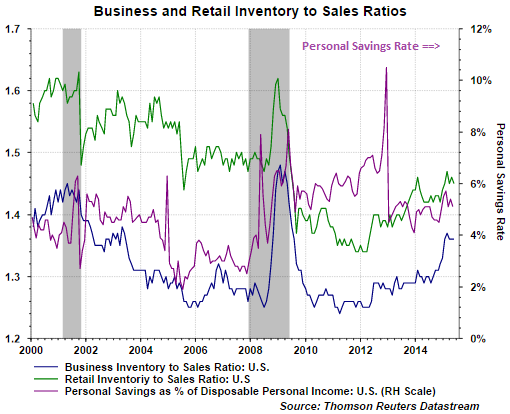 A result of what seems like a pullback in consumer spending is business and retail inventory to sales ratios continue to increase. Some of this build is a result of an inventory build following the disruptive issues in the first quarter. However, with a slowdown in consumer spending and potential slowing in inventory build in the economy, these two factors will have negative implications for GDP growth in the second quarter. Lastly, earnings reports for Q2 have, so far, exceeded analyst lowered expectations. Thomson Reuters notes through July 24th, 77% of companies have reported positive EPS surprises; however, only 52% have beat on revenue. 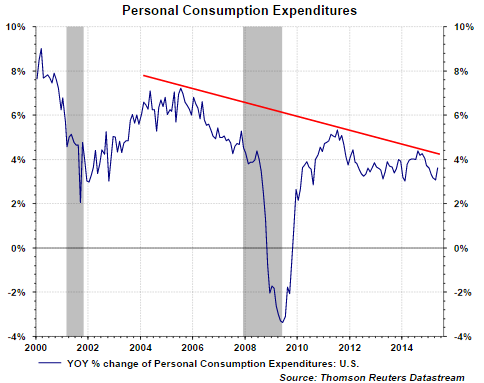 The consumer seems to have weakened through the second quarter. With the consumer accounting for about 70% of economic activity, a more positive consumer will be needed to provide economic strength in the second half of the year. Oil prices seem to be taking another leg down with many commodities following suit. These lower energy prices should begin to show up in lower gasoline prices as well and may be necessary to stimulate consumer confidence and consumer spending. 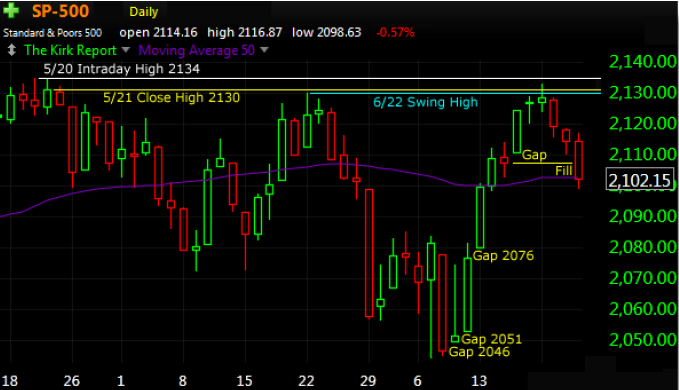 Since February the S&P 500 Index has essentially traded sideways within a 4.8% trading range. This sideways market movement may be resulting in a trading pattern where the market is correcting over time versus correcting with a steep price drop. A sideways market correction enables earnings to catch up to the market's price. As the below chart shows, several of the technical indicators suggest the future market direction is one where the price could trade to the bottom of this trading range highlighted by the yellow box on the chart. "As shown in the chart [below], the S&P filled the first lower gap, tested and bounced from the 38.2 fibo, and then closed right at first support at the 50 day at S&P 2102. This is seen by many as an important support level that if not defended will soon bring the three other lower gaps into play as trade to targets." One question is what factors will cause the market to trade to the upside and out of this trading range? One fundamental factor is that of company earnings growth. Recent earnings reports have generally beat analyst expectations, yet S&P 500 earnings growth for Q2 is expected to decline about 2%. Top line revenue results have been weaker than expectations in Q2, with companies citing headwinds from the stronger US Dollar. A positive is the energy and currency headwinds will begin to subside in Q3 and especially in Q4 and Q1 of 2016 as these headwinds are lapped in the year over year comparisons. In Q4 2015 and Q1 2016 earnings growth is expected to be about 4% and 9%, respectively. This better earnings growth could be a catalyst for higher equity prices beginning later in Q3 and into 2016. An interesting facet of the American Associations of Individual Investors Sentiment Survey has been the recent long streak of an above 40% reading for the neutral sentiment category. This week represents a record 16th straight week with the neutral reading above 40%. Although the neutral reading remains high, this week it did fall from last week's 45.95% to 41.87%. More of these neutral investors have now become more bearish as the bearish sentiment reading increased 2.36 percentage points to 25.60%, whereas the bullish sentiment reading increased a lesser 1.73 percentage points to 32.54%. 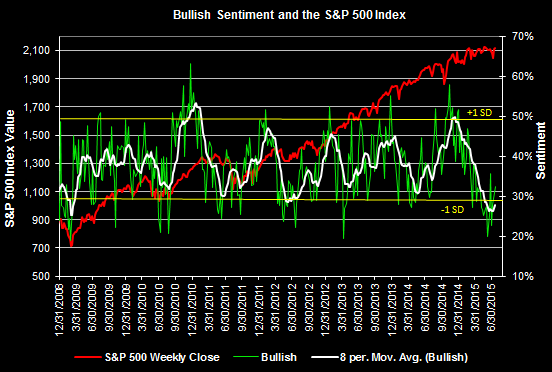 As the below chart shows, bullish sentiments remains at a relatively low level, near 1 standard deviation below its long run average. Additionally, the second chart below shows the 8-period moving average of the bullish sentiment reading and it remains near its lowest level since the end of the financial crisis six years ago. In our recently published Summer 2015 Investor Letter we highlight issues impacting the market in the first half of the year. In the second quarter the world was not short of market influencing events as Greece, China and Puerto Rico all dominated the headlines. The second quarter proved to be another challenging quarter partially due to these events and volatility erased much of the year’s gains. However, U.S. economic data was certainly a bright spot as positive reports provide some optimism as we enter the second half of 2015. Beginning in the third quarter, the headwind resulting from the strong US Dollar and energy weakness should begin to subside and make year over year comparisons more normalized. Todd joins HORAN Capital Advisors with over 10 years of portfolio management experience and nearly 20 years of industry experience. Todd graduated from the Kelly School of Business at Indiana University and spent a number of years at PricewaterhouseCoopers and Fifth Third Bank. He holds the Chartered Financial Analyst (CFA) designation and will bring great value to our client relationships with his knowledge of portfolio construction, security analysis and long-term planning. Matt is a recent graduate of the University of Notre Dame where he carried high honors while majoring in Finance and Spanish. Matt is already pursuing his CFA designation and will take Level I this December. Matt will support the portfolio managers at HORAN Capital Advisors and we look forward to his contributions. Recent market commentary has highlighted the weak market breadth in spite of the equity market's continued move higher. Weak market breadth refers to the technical situation where more equity issues are declining than rising. This weakness raises a red flag in an environment where breadth is negative and the equity market continues to move higher. 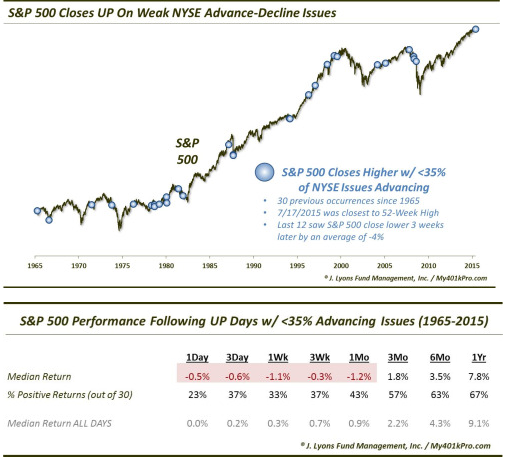 Below are a couple of charts and article links noting the weakness and subsequent returns when this occurred in the past. 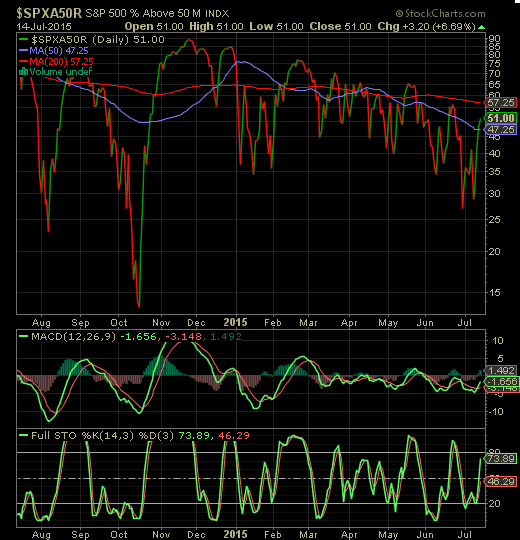 Certainly, the breadth technical picture is something investors should continue to evaluate. However, what is equally, if not more important, are company fundamentals and the valuation level of the overall market. Below are a couple of charts on two market sectors that have attracted a lot of investor attention this year. 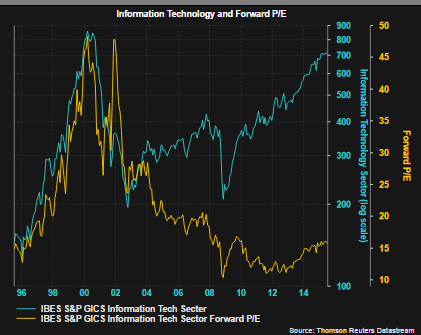 The first chart compares the S&P GICS Technology Sector to the forward P/E for the 67 companies that currently make up the sector. As can be seen from the chart, valuations are no where near the sector valuation reach prior to the tech bubble bursting in 2000. In 2000 the PE reached nearly 50 for the sector where today the sector is trading at a PE multiple of just under 15 times earnings. 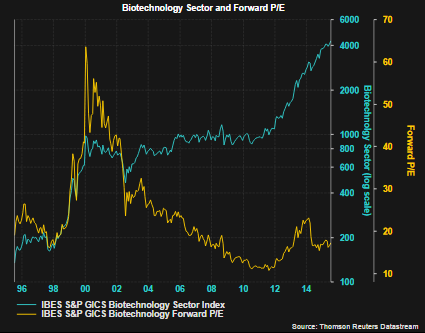 Another sector that continues to attract investor interest is biotechnology. As the below chart for this sector shows, the biotech index (8 companies) has risen significantly since 2012. In spite of this sustained move higher, the sector PE is just over 17, far below the 2000 peak of 63. Lastly, even the broader S&P 500 Index itself is not trading at the technology bubble level reached in 2000. 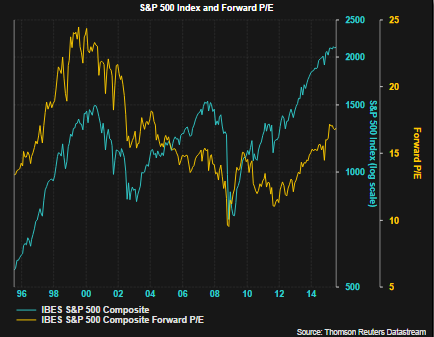 The current forward PE is 17 versus the 2000 peak of 24. The current PE is just slightly above its long term average. 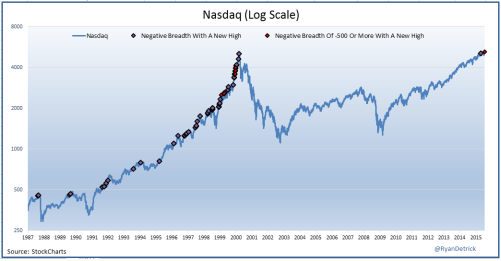 The weak market breadth is a variable investors might want to track, keeping in mind market valuations are far below the levels reached in early 2000. A critical variable will be corporate earnings looking out for the next four quarters. Companies have begun reporting their second quarter results (60 companies reported through 7/17). Earnings growth for the next four quarters is projected to back-end loaded. Thomson Reuters I/B/E/S is estimating Q2 2015 through Q1 2016 quarterly earnings growth will equal: -2%, -1%, 4% and 9%. And finally, just a brief comment on individual investor sentiment, which we also review in our just completed Summer Investor Letter. 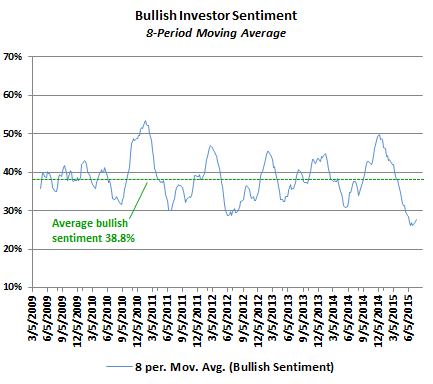 AAII individual investor bullish sentiment was reported at 30.8% last week, which is nearly one standard deviation below the average bullish sentiment level. 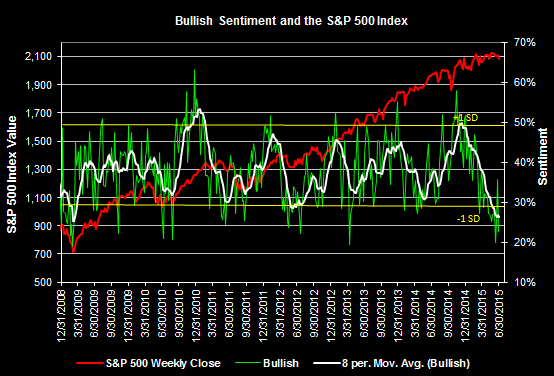 Two weeks ago the bullish sentiment reading fell to a low 22.6%. This low level of bullishness reported by individual investors is a contrarian indicator. 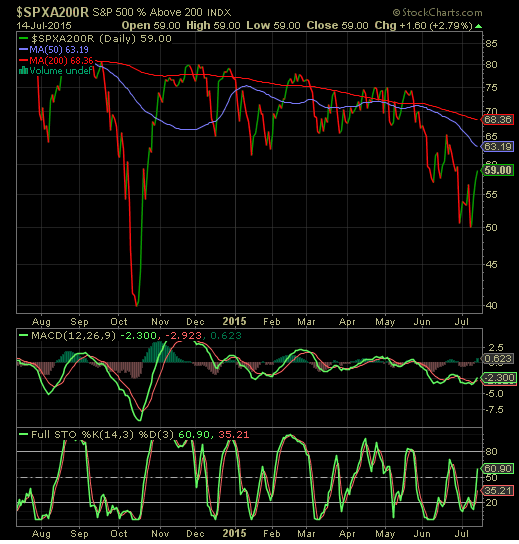 Could the market be positioning itself for a rally to finish off the summer? Ryan Detrick wrote an article today, Investor Sentiment: Why A Market Correction May Be Slipping Away, that provides a good analysis of other sentiment indicators and what these indicators might suggest for market performance in the coming months. Was Today's Twitter Buyout Hoax An Indication Of An Overvalued Market? The Twitter (TWTR) buyout offer hoax this morning have some believing this is an indication the market is trading at an overbought level. The thinking is investors are taking trading positions based on rumors versus evaluating company facts and company fundamentals. Mark Hulbert, a senior columnist at MarketWatch and the editor of the Hulbert Financial Digest, published an article late this afternoon, Why the Twitter Hoax Suggests the Market is Near a Top. 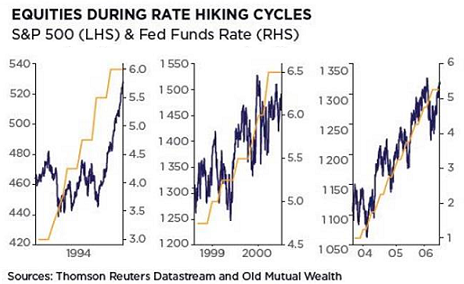 In the article he notes, " ...investors are increasingly resorting to betting on rumors as they become unable to find stocks that represent genuine long-term value." Mark Hulbert may certainly be right in noting the market is at a top; however, and equally or more important is the analysis of specific stock and market fundamentals. 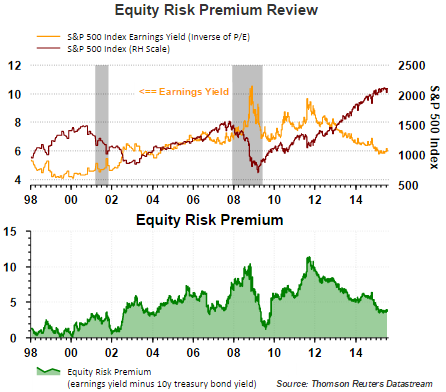 Broadly, from a market perspective, the valuation or price earnings ratio (P/E) of the market, does not seem indicative of an extremely overvalued market. The excellent J.P. Morgan Guide to the Market, contains a P/E chart for the S&P 500 Index that shows the forward S&P 500 P/E is just above the long term average P/E going back to 1990. 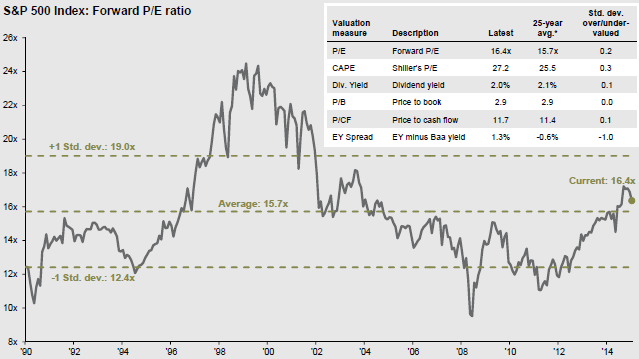 Other valuation measures detailed in the below chart also are not indicative of an extremely overvalued equity market. For sure though, the easy money seems to have been made since the end of the financial crisis over five years ago, in the U.S. anyway. Other technical market indicators also seem to indicate the market is, at a minimum, in a short term oversold level and beginning to move to a higher level. 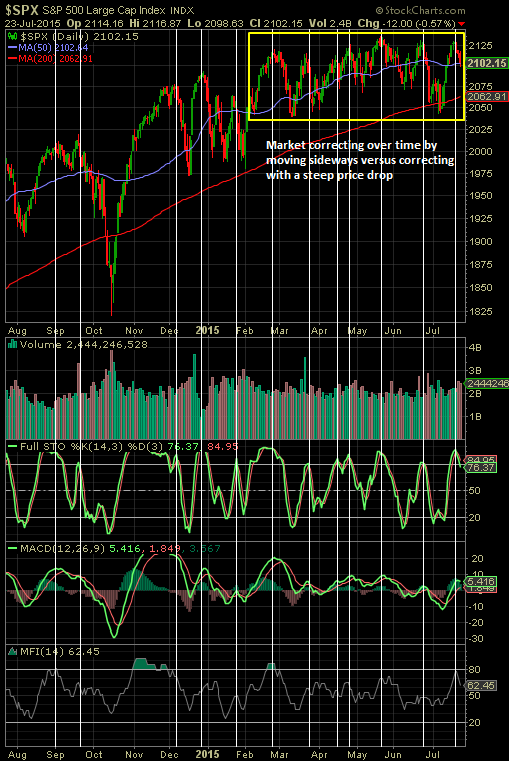 As can be seen in the below chart, the S&P 500 Index has found support at its 200 day moving average and is beginning to move higher over the last three days. 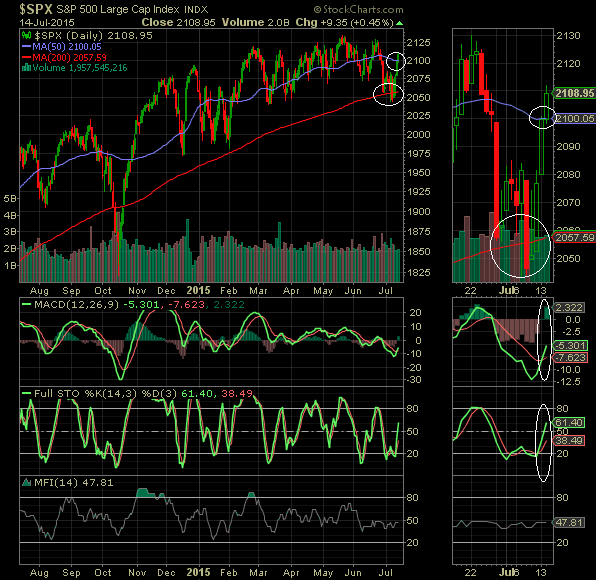 Also, the MACD and stochastic indicators have turned positive from oversold levels as well. Lastly, the percentage of S&P 500 stocks trading above their 50 and 200 day moving averages recently reached levels indicative of a short term oversold market and are now moving to higher levels as the S&P 500 moves higher too. In investing nothing is a certainty; however, the potential resolution (kick the can) of the Greece situation seems to have eased some of the near term anxiety of investors for the time being. As second quarter earnings season unfolds, a potemntially clearer picture on the business environment will be forthcoming. 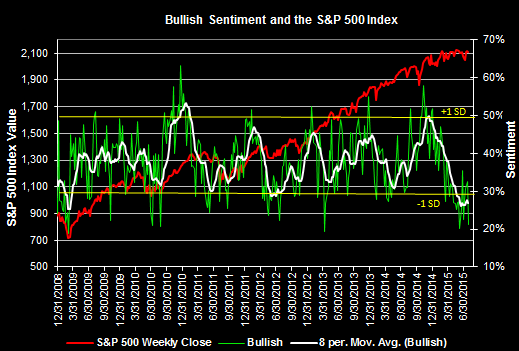 The American Association of Individual Investor's sentiment survey release this morning shows bullish sentiment fell nearly thirteen percentage points to 22.6% The previous week bulls switched to the bearish camp with bearish sentiment increasing 13.4%. The bull/bear spread is now -12.5%. As a reminder, this contrarian sentiment measure can be volatile from week to week and is most predictive at its extremes.